Most translators are all too familiar with the “free instant translation” services available online. I tried boomerang-translating, first using a translation website to translate from English to a target language, and then back-translating to English. Doing this shows what happens when the peculiarities of English are stripped away. If an English phrase or construction doesn’t have an exact counterpart in the target language, the translator has to make decisions based on meaning. When the translator and back-translator are making decisions based on words and phrases in their databases, the result can be pretty odd. Disclaimer: My method was unscientific; I chose translation websites at random (names omitted to protect the guilty). I translated to and from languages I can read at survival level (Spanish, French, German) and others I don’t know at all. I’ve skipped the few translations I obtained in non-Roman text, but presented some of the boomerangs. Boomeranging in real life. Colleagues once brought me a protocol for a laboratory instrument washer that had titles like: Instructions to respect in case of changing the product formula. Nobody was sure where the book came from, so I tried back-translating from German, because US tech writers here say German companies make employees translate their own protocols using the English they learned in high school and forgot. A website gave Anweisungen, um respekt für das produkt ändern Formel, which back-translated to For instructions on how to respect for the product formula change. No good. For French, the website gave Consignes à respecter en cas de remplacement de la formule produit. Even to my scant French it didn’t sound right, and sure enough, back-translation produced a disturbing command: Baggage rooms to be respected in case of produced replacement of expression. But another site gave Les instructions de respecter en cas du changement de la formule de produit and back-translated to Instructions to be followed in case of replacement of the formula product. Aha! We sent the book off for improvement by a professional translator of French to English. Later, the machine was moved and dusty installation diagrams found underneath it moved bore a company address in France. A simple sentence: She told him not to go meet them until six. Well, I thought it was simple. Both word order and declension pinpoint the subject, object, indirect object, and which verb is the main one. True, someone writing for translation might replace “go meet” with “go to meet,” and follow “until six” with “o’clock.” And English has lots of prepositions, so they can be used to convey a lot of information; “until” marks the end of an interval of time, not distance. The Spanish auto-translator had no problem and back-translation even added the missing words. Ella le dijo no a ir a reunirse con ellos hasta las seis./She told him not to go to meet them until six o’clock. That was the only language for which it quite worked. In Filipino, the subject and object may have been preserved, but it did no good because the genders got swapped, and the computer flunked the “until” test. Sinabi niya sa kanya hindi upang pumunta matugunan ang mga ito hanggang sa anim./He told her not to go meet them up to six. In French, the auto-translator tried to make sense of “go meet them” by inserting “their meeting,” which clarified the phrase with a little more redundancy than English uses. Elle lui a dit ne pas y aller à leur rencontre jusqu’à six. A human knowing both languages would back-translate easily. The computer’s attempt: She told him to not go there at their meeting up to six. In German, the auto-translator felt the need of a comma to follow “she told him not,” perhaps because of its archaic meaning, “she didn’t tell him.” In any case, the back-translation started leaking there and by “until” it sank: Sie sagte ihm nicht, gehen sie bis sechs treffen./She told him not, they make up six. For Traditional Chinese, I can only speculate on what the auto-translator did to come back with She tell him not to man them until six foot. Chinese has fewer tenses, though there is a past tense in Chinese, and “told” is an oddball even among the irregular verbs that came to English from German, “To man” is one of those nouns that can be a verb, but I’m stumped about how it crept in here. Parallel construction: I want to progress from sitting in the audience to standing at the podium. This sentence starts with a clear subject, verb and object followed by two clauses, each one made up of a gerund, a preposition, an article and a noun. What could be simpler? Hah. For one thing, “to” here is part of an infinitive and also a preposition. A translator has to interpret the object of “I want” as an infinitive verb, not some kind of noun phrase although “progress” is usually a noun. In French, the result was Je veux faire des progrès de m’asseoir dans l’audience à la réputation à l’estrade. Reputation? I couldn’t find it in any dictionary as anything but its English cognate. Googling réputation à l’estrade produced no hits. Auto-translators don’t exclude a phrase just because no self-respecting writer would use it. 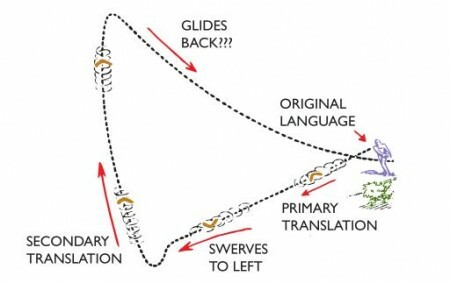 Most likely it resulted from one of the most oversold features of computer translation, that the software “learns” by storing past translations in its database. Something once told the auto-translator that “reputation” helps amplify the sense of the progress from listening in obscurity to speaking from renown. Of course the elegant touch only made things worse: I want to make progress to sit down in audience in reputation in the podium. In German, the “podium” got lost, the clauses had to be rearranged a bit, and “progress” didn’t make it back as a verb. Ich will davon fortschreiten, im Publikum zum Stehen an der Bühne zu sitzen./I will of progression, in the audience to stand on the stage to sit on. Notice the inserted comma there? I googled davon fortschreiten and found nothing. Auto-translators certainly get creative. Spanish really had me fooled. I thought this looked fine: Quiero progresar de sentarme en el auditorio a la posición en el podio. But “the position at the podium” wasn’t in the back-translator’s database and the back-translating “de” required more understanding than the computer possessed: I want to progress of sitting down in the auditorium to the position in the podium. Filipino came so close I felt almost bad about the ridicule one little preposition would heap on the speaker: Gusto ko sa pagsulong mula sa upo sa ang madla sa nakatayo sa ang plataporma./I want to progress from sitting in the audience standing on the podium. Unusual terms: Nik Wallenda climbed up a scaffold, stepped onto the steel cable and slipped the harness of his balancing pole over his head. This came from a New York Times article by Thomas Kaplan, and includes the kind of specialized term that can confront translators. A translator can gather that a “balancing pole” is a tool used by the famous tightrope walker, and that “balancing” isn’t something a pole does by itself. The need to understand that, and to know the prepositional phrase “of his balancing pole” is a modifier for “harness” made this sentence a general Waterloo for all the auto-translators I tried. In Spanish, the back-translator couldn’t recover the sense of “stepped on” or “over his head,” and the different meanings of pronouns, together with the balancing pole, wound up casting aspersions on the reader: Nik Wallenda subieron un andamio, pisó el cable de acero y se resbaló el arnés de su contrapeso en la cabeza./Nik Wallenda went up a scaffold, floor the steel cable and slipped the harness of your weight in the head. Back-translation from French made the pole balance itself, scrambled the meanings of the verbs, and left Nik in an uncomfortable spot: Nik Wallenda grimpa sur un échafaud, renforcé sur le câble d’acier, a glissé le faisceau de son pôle équilibrage au dessus de sa tête./Nik Wallenda rode on a scaffold, strengthened on the steel cable, slipped the beam of her pole balancing on top of his head. The German auto-translator didn’t have to insert a comma because it was already there, but the direct and indirect objects of “slipped” had to move and as a result the back-translator threw Nik on the floor: Nik Wallenda kletterten auf ein Gerüst, auf dem stahlseil und rutschte von seinem balancing pole das gurtzeug über seinem Kopf./Nik Wallenda climbed on a scaffold, on the steel cable and slipped from his balancing pole the harness over his head. The Russian auto-translator’s database may be stuffed to the gills with idioms. At least, that’s the only explanation I could think of when back-translation produced Nik Wallenda grew up to directorship of liquidated the shoulders on the steel cables, and fell on the development of its balance pole on the head. Putting some of the phrases into the auto-translator’s maw confirmed that “climbed up a scaffold” translated to “grew up to directorship,” which, in career-speak, it may. “Stepped onto the steel cable” translated to “Strengthening the shoulders on the steel cables,” but perhaps directors are more prone to liquidating things. Rendering “harness” in terms of development makes a kind of sense, if only that verb “slipped” didn’t turn into Nick falling from directorship onto his pole and then his head. Adage: Nothing ventured, nothing gained. Some databases contain good translations of short little sayings like this one. It’s really an “if…then” sentence, in the passive voice, with the verb “to be” left out: If nothing is ventured, nothing will be gained. So I expected any computer without a human-chosen translation on hand to fail. In Chinese, the use of passive voice together with the lack of a subject appeared to convince the auto-translator that the phrase was a sentence in the imperative (or the database contained a similar adage in the imperative). Back-translation turned the meaning on its head: Do not dare to do, what have not been. Other translation results looked surprisingly accurate, at first. In French, German and Filipino, the sites returned the expression with phrases that appeared to convey the meaning and aesthetic appeal of the original: Ne tente rien n’a rien (Fr), Nichts gewagt, nichts gewonnen (G) Wala ventured, wala nagkamit (Fil). The translation from Spanish looked adequate, though less catchy: Nada se aventuró, no hemos ganado. What is a better translation? Reflections on Six Years of Running Evaluation Campaigns, 2001, Philipp Koehn, Tralogy. This is a readable overview of the mechanics and problems of computer translation, available online from the author here. mimi posted this article under Business Tools, Machine Translation	on Saturday, September 1st, 2012 at 12:07 pm	You can follow any responses to this entry through the RSS 2.0 feed. Both comments and pings are currently closed.